Women's Soccer has won six Big South contests to start league play, and has not given up a goal to a Big South opponent yet. The Radford University Women’s Soccer team continued their five game shutout streak on Oct. 13 with a win over Gardner-Webb University, thanks to an early goal by sophomore forward Julie Ruh`e and stiff defense by the rest of the squad. The victory served as a redemption game for RU against the Runnin’ Bulldogs, who knocked the Highlanders out of the 2010 Big South tournament in the first round of play last year. With the 1-0 victory, RU moved to 9-3 on the season and remained undefeated in the Big South conference. At the 12th minute, sophomore forward Krissia Vasquez controlled the ball, then found junior forward Mary Wiley up the field, who then passed a long ball to Ruh`e who found the back of the net. Ruh`e leads the Highs with five goals on the season. This is the second game in a row that Vasquez has assisted Ruh`e in a goal. The fierce wind and rain, which started shortly into the second half, didn’t stop the Highs from challenging Gardener-Webb. The ball remained on the Runnin’ Bulldogs’ defensive end for most of the match. Freshman midfielder Kara Nay nearly scored in the 61st minute, but her shot bounced off the cross bar. Senior goalkeeper Lisa Lubke picked up two saves during the game while Gardner-Webb goalkeeper Erika Lenns made five saves and gave up one goal. 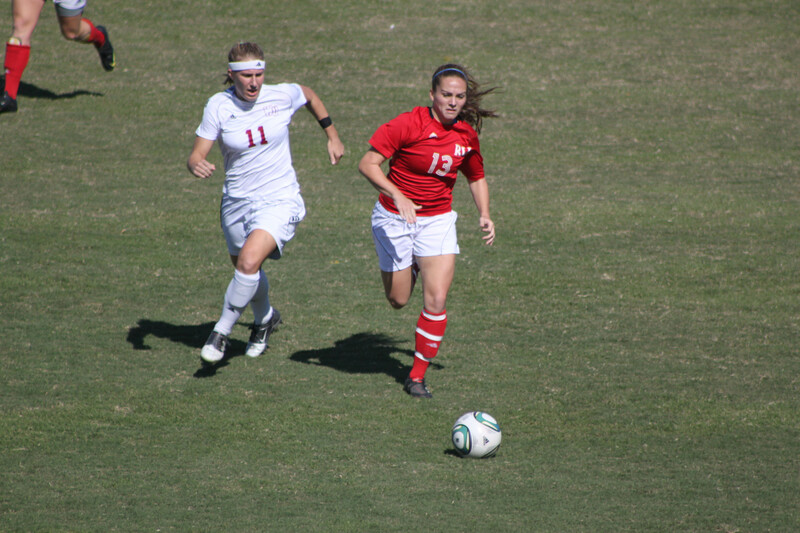 RU continued their win streak on Oct. 15 with a convincing overtime win over Winthrop University at Cupp Stadium. The Eagles came into the match ranked second in the Big South conference, and owned a 4-1 record. Winthrop goalkeeper Sara Schippers kept Ruh`e from scoring in the 34th minute after Ruh`e launched a shot from inside the box. Radford out shot Winthrop 17-12 on the match. The match was hard fought by both squads, neither of whom managed to score a goal in regulation. Finally, after nearly 100 minutes of play, sophomore midfielder/forward Kathryn Johnston scored with 34 seconds remaining in the first overtime period. Johnston’s golden goal gave RU the victory. The win pushed the Highlanders to 6-0 in the Big South, which is a new conference record for most consecutive wins to start conference play. What’s even more significant is that all six of the Highs’ victories have come by way of shutout; RU owns a scoring ratio of 8-0 in Big South play. All in all, the Highs have posted 10 shutouts in 14 regular season games for the 2011 season. Sophomore goalkeeper Che’ Brown made four saves and gave RU their sixth consecutive shutout. Brown is third in the nation in terms of save percentage (0.95 percent) while the Highs are eighth in the nation in terms of shutout percentage (0.66 percent). The Highs’ next match will be a 7 p.m. contest on Oct. 20 against High Point University.